SAGE is the UK's Stakeholder Advisory Group on ELF EMFs. More on SAGE generally. Its First Interim Assessment in 2007 covered possible precautionary measures for house wiring, appliances, and power lines and property. The Government responded in 2009. 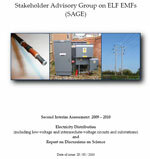 SAGE has now (2010) published its Second Interim Assessment, covering, principally, low-voltage distribution networks. It groups the options by the different parts of the distribution system and we summarise the recommendations here. See also a full list of recommendations. Exposures from distribution circuits arise from net currents. In turn, net currents arise from either multiple earthing or from interconnected neutrals. Both of these have safety benefits and SAGE decided it was not justified to remove them. But SAGE does recommend measures, mainly existing best practice anyway, to reduce net currents: e.g. balancing loads across phases and using plastic gas and water pipes. One particular feature - broken neutral conductors - can produce high magnetic fields, and SAGE is keen that DNOs investigate and repair these. Similarly, broken neutrals could be detected in principle by routine measurements, but SAGE decided further investigation was needed of the practicability of this. SAGE endorsed existing best practice to site plant rooms away from occupied areas and to use low-field arrangements for risers, but decided that retrofitting these would have to be a matter of consumer choice and cost. Intermediate voltage circuits - mainly 11 kV and 33 kV - are not usually a major source of elevated fields, but can be when heavily loaded. SAGE recommended that heavily loaded circuits should have optimum phasing (already recommended by SAGE and adopted for high-voltage circuits) and balanced loads. Any restrictions on proximity of such circuits to homes etc (rejected by the Government for high-voltage circuits) would need further investigation. For instances where substations do produce high exposures, SAGE recommends two new measures. One is that Distribution companies should always be willing to investigate and offer the consumer options for reducing the field (at the consumer's cost). The other is that DNOs should these instances so that EMF issues can be factored into future refurbishment decisions. SAGE recommends more information for the public, and that DNOs should always be willing to investigate EMF issues when reported to them, and should train their staff to recognise how EMF issues can sometimes be an indication of system problems. In June 2011, the Government issued their response. This led to an Engineering Recommendation published in March 2013 that implements the SAGE recommendations applying to low-voltage distribution networks.